After enjoying reading many fantastic book blogs for some time now, I thought that I would finally take the plunge and start a blog of my own. This blog is going to be purely for fun and somewhere to keep all my bookish thoughts and reviews in one place. It will mainly be about books, but there may well be some other snippets too, for example photos of favourite places I come across on my travels creeping in. I’m Karen and live in Essex, in the UK. I’ve always loved reading from a very young age – and can still remember enjoying Enid Blyton’s Famous Five and Secret Seven series along with many other childhood favourites including What Katy Did and Heidi before progressing on to Agatha Christie – it was Agatha’s books which first gave me a love for crime. Over the years my enthusiasm for books has increased. My idea of bliss is to curl up in a comfy chair with a good book. I have a long commute into London for work (I’m a legal secretary) so I usually have around 2 hours reading time every weekday whilst on the train – not as comfortable as my reclining chair but at least I have some uninterrupted reading time! I love to discover new authors to read and enjoy reading books across different genres (see reviewing info page for details of what I’m not so keen on). 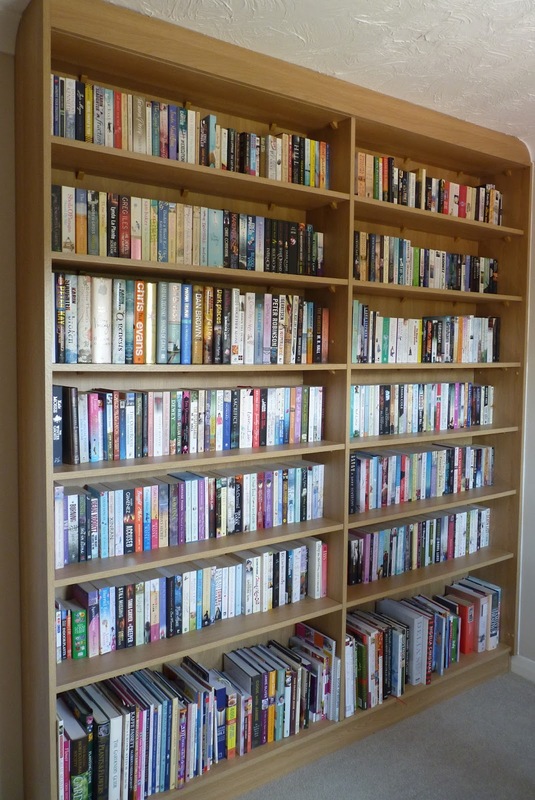 My collection of books has now filled all my bookcases and shelving which is why I love my Kindle – I’m now on my 3rd, having worn out my previous two! 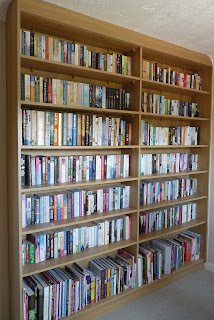 I find them invaluable now that I’m running out of space – I can still feed my book addiction but invisibly! I do still love paper books however, nothing can beat the feel or smell of a book! I’m not a professional reviewer and do have a full time job so my reading time can be limited, and how many books I can read depends on their length and hoping that life doesn’t get in the way of my reading. Below is a picture of my “bookwall” in the spare bedroom, although I do have more bookcases overflowing with books! I hope my reviews are helpful in deciding your next read – and please feel free to comment on any post. I love your blog. Your 'about me' sounds familiar! I too started with Enid Blyton books such as the Famous Five and Secret Seven. I was give "What Katy Did" as a school prize when I was about 6/7. I think we possibly have similar tastes in books. I like all sorts: crime, thriller, romance, family sagas. I've recently retired from work as a legal secretary/paralegal after 26 years with the same firm.